Do not shot against walls or any hard substance. This may damage the arrows. If the arrow fletching was received bent,it can be straightened by using air dryer or being soaked in hot water. 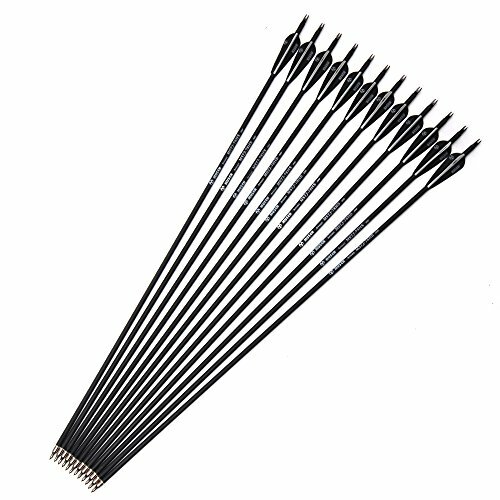 MUSEN 12PCS/Pack 30 inch 7.8mm carbon shaft arrows. Suitable for 30-50 pound compound bow and recurve bow. Tight nocks can help to grip the bowstring better. Adjust the orientation of the nocks for a recurve bow or longbow. Arrowhead is made of stainless steel, which is removable and interchangeable. Screw-on 100 grain field points for more accurate shooting. The carbon shaft and steel tip contrubute to the optimal accuracy and target penetration. Safer than normal fiberglass arrows. Fletched with 3" TPU vanes, two Black and one White. If you have any questions about this product by MUSEN, contact us by completing and submitting the form below. If you are looking for a specif part number, please include it with your message.